Blog Tours and Guest Posts - Please Read! How do we pick a "Book of the Week" ? Want to work with us? More things we do! Here's a really lovely little book that really encourages you to dive in - though not literally of course! Preposterous Rhinoceros features a larger than life Rhino who decides to volunteer when Lion has a horribly sore throat, and can't read a bedtime story to the animals as usual. Salamander can read beautifully but she's too shy, so Rhino steps into the breach. There is a slight problem though, Rhino is a little bit confused as to how you actually get a book to do its thing! "Just dive in, lovey" says Drama Llama (one of my fave characters, she reminds me of my sister!). Rhino takes her at her word and soon ends up with a very sore nose, owch! "Get Stuck In" others advise, but again Rhino completely misunderstands and books and Rhinos don't really work together when they're covered in gooey sticky honey. It takes shy salamander to point out that the very best way to get the most from a book is to learn how to READ it! She patiently teaches Rhino to read, and he's ready for his storytelling debut - just in time for Lion to come back with a ROARRRR! Oh no! Will Rhino ever get to tell his bedtime tale? Join us for a read, and find out! 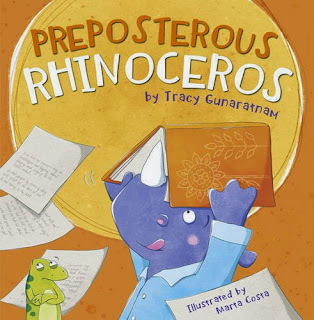 Preposterous Rhinoceros is out now from Maverick Publishing. Daddy's Favourite bit: Loved the bit where Rhino's shy little Salamander friend is teaching him to read properly. Like this? We think you'll love these too! Follow us on Twitter or subscribe to our mailing list! Click here to subscribe to our mailer service so you NEVER miss a post! 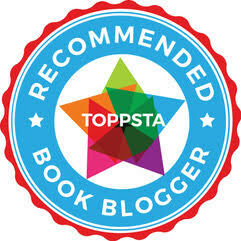 We're a Toppsta Recommended Book Blogger! A brilliant new subscription service for letter-loving kids - Let's meet Banjo Robinson the Globetrotting Cat! Text © Phil & Charlotte. Blog content protected under a creative commons license. . Powered by Blogger. We love to read these - want to be here too? Contact us! Did You Ever Stop To Think?